Everyone knows what software bugs are: flaws in a program that make the software fail or behave in unwanted and unexpected ways. Bugs are unavoidable in something as complex as software. The most we can reasonably ask of programmers is that they try to lessen the frequency and severity of bugs by using sound programming practices, and that they correct bugs quickly, once found. Bugs are unintentional, whereas virus, Trojans and other malware are created with malicious purpose. But, between unintentional bugs and willful malware, there is an entire class of problems caused by intentional programming decisions: when software features work as designed, but the design itself is ill-thought-out. 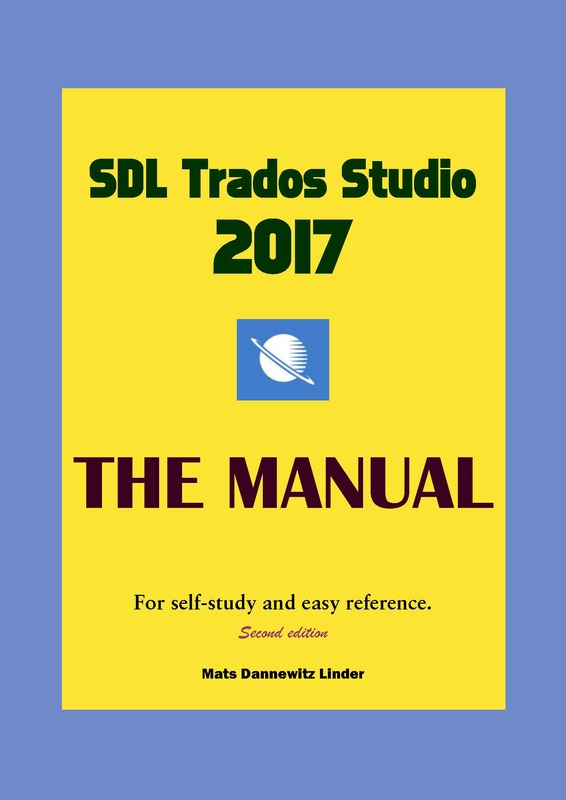 I'll give two examples from SDL Trados Studio and memoQ. In Studio, an example of flawed design is the deliberate disabling of "smart quotes" when change tracking is active. According to SDL, "This currently is by design so that no uncontrolled/automatic changes should happen when typing in review mode." However, they didn't think through the real-world consequences of their decision: now, a translator may use smart quotes during translation, but since they are disabled during review, any apostrophe or quote entered during review will be straight. After review, the text of the translation will contain a mess of straight and curly quotes and apostrophes. SDL Studio: The translator used smart quotes, but the apostrophe used during review is a straight single quote. Furthermore, apostrophes and quotes are tiny characters: it is entirely possible no one will notice the problem for a while. The first person to notice might very well be the customer... perhaps when he receives the final printed copy, after it is too late to correct the error. Disabling smart quotes when change tracking is active is harmful, and the problem is made worse because it is not well documented. For me, I have a good workaround: a short program I wrote in AutoHotkey that allows me to use two different types of smart quotes (and also straight quotes) with no tweaking of Studio's settings, no matter whether change tracking is active. Maybe, under certain circumstances, it would be better to disable smart quotes during review, but this is a decision that should be left to the translator, not imposed by SDL. Let's now pass to Studio's main competitor, memoQ. Here, the flawed feature is a change introduced with version 8 of memoQ: a new behavior, touted as an ergonomic improvement, of the Shift+F3 "change case" function. Before version 8, Shift+F3 behaved in memoQ much the same as in Word, Studio, or many other programs--it toggled through the various permutations of change case: all lowercase, ALL UPPERCASE, and Mixed Case. Now Shift+F3 opens a drop-down menu, where the user can select the case. memoQ: An unecessary drop.down menu for a simple function. The result is the same, but the new "feature" hinders smooth typing by shoehorning in the workflow a change no user had sought. The new behavior slows a translator used to hit Shift+F3 a couple of times, until the desired case is achieved, then press the right arrow and continue typing. Changing case now often requires at least an extra keystroke; worse, it introduces an unnecessary change in a behavior that most users had imprinted in their muscle memory. And since Shft+F3 continues working as before in other programs, the irritation caused by the change will not fade away as you form new habits. Unlike with the Studio example, there is no workaround: the only thing you can do is return to memoQ 2015, abandoning any useful feature added in version 8. I imagine that if Kilgray introduced this new feature, someone must have either asked for it or thought it was a brillant idea. 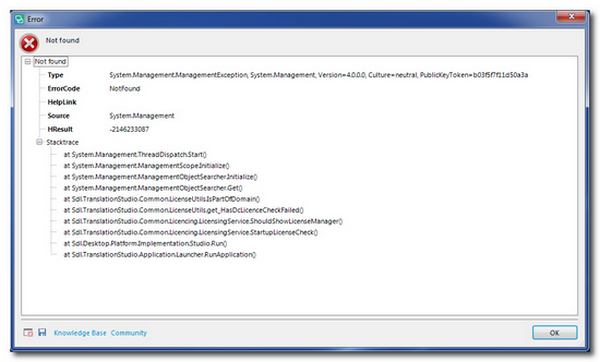 Instead, just like SDL's disabling smart quotes in change tracking mode, it is a bad programming decision. As I mentioned before I use a short AutoHotkey program to enter smart quotes and apostrophes in Studio. The program lets me enter "smart" single and double quotes, curly apostrophes, "French"double quotes, and also, when I need them, "straight" double and single quotes. This works for me and would work for other Italian translators as well. If you need a copy of this utility, let me know, and I'll be happy to send it to you "as is". I can customize (for a small fee) this utility to use different sets of single and double quotes. If you are interested, please write me (you can use the contact form in this blog). Many translators believe that machine translation (MT) is a horror story, and that using machine translation (MT) in our work only results in bad quality. Indeed, after I started advertising GT4T (Google Translate for Translators) on Facebook, the reactions I got from many translators were negative. They are right to think that the overall quality of machine translation is bad, and that any translator who mindlessly uses machine translation puts his or her career at risk; but the quality of machine translation is improving: Google’s neural translation engine, for example, has surprised many, to the point that some agencies have started using it to replace human translators, relying afterwards on translators as post-editors--a situation that creates even greater hostility against MT among translators, who are rightfully afraid that post-editing means for them toiling at mind-numbing grunt work. Most of us use on-line reference tools in our work; when an online reference tool gets better, it helps us more. In my opinion, MT is the most advanced technology in translation, and, therefore, it should benefit professional translators first. If we consider MT as a reference tool rather than a threat, shouldn’t we be glad when our tool gets better? I never liked the idea of letting MT translate and translators confined to an unrewarding task of post-editing; however, we can use MT to “translate” a word, a term, a phrase, or a part of a sentence that we judge it will translate well. Sometimes MT returns nonsense, true, but most of time, when used carefully it provides a surprisingly useful translation. I developed GT4T because I wanted a tool that could help translators (and not translation companies) make the most of Google Translate, without becoming ourselves post-editors. Copying and pasting between Google Translate and your work is not a good solution, as it takes too much time. Some TM tools already include MT, but they all submit the whole sentence to MT: you cannot choose to have MT translate only part of a sentence. 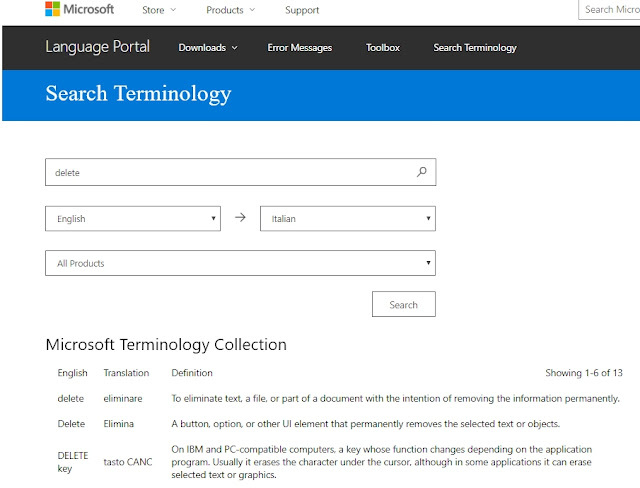 GT4T is a tool that lets you submit any portion of a sentence of your choice to MT with ease. 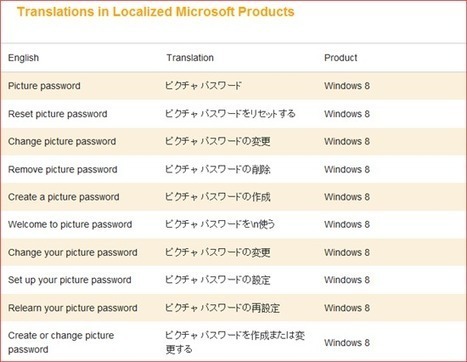 It’s very simple: you select some text anywhere (including from inside a CAT tool), press a keyboard shortcut, and the selection is replaced by translation from MT. Simple as it is, I believe it is the correct way of using MT. As we use keyboards most of time, GT4T painlessly incorporates MT into our workflow. A usual problem with MT is inconsistency--the MT engine translates the same term differently in different sentences. 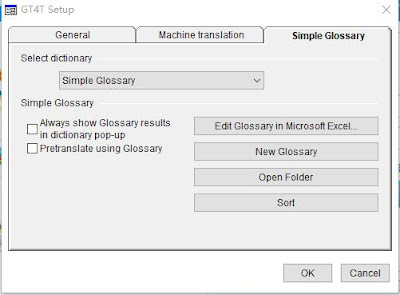 GT4T has a simple glossary feature to solve this issue. You press a keyboard shortcut to add a term to GT4T’s glossary, and that term will be pre-translated before submission to MT; thus the results suggested by MT will be consistent. GT4T also offers the option to use both Google Translate and Microsoft Translator at the same time. The results from both engines appear in a popup, and you can then press 1 or 2 to paste the corresponding translation. I expect there are still many years ahead before MT can effectively replace us. Before that happens, MT can be a great aid--a tool that can increase both the speed and the quality of our translations, if used properly. 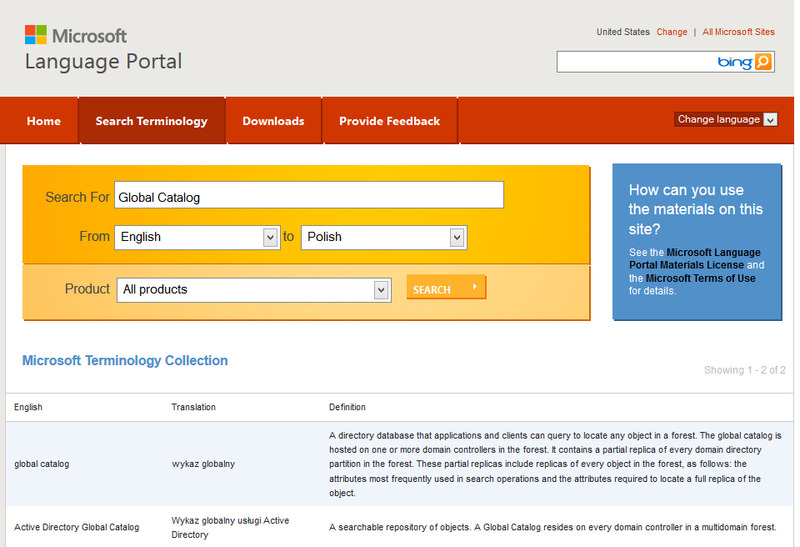 A tool for translators, instead of a tool to replace translators. 1993 – Atril develops Déjà Vu software, the first Windows-based Computer-Aided Translation Tool (CAT tool) on the market. 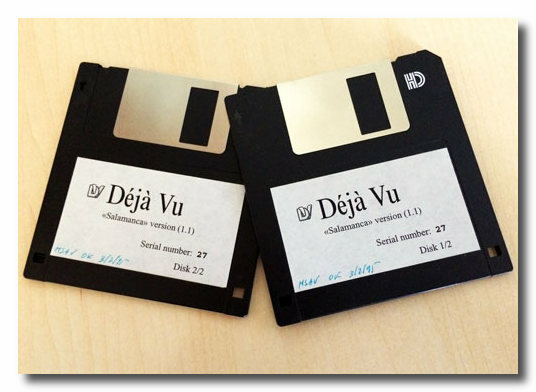 A couple of original Déja Vu diskettes. They might even still be in good working order (that is if one had a computer with Windows 3.1 on it). There is a date written in pen on them, from '95, when I must have checked those disks for integrity. But I know I had bought DV before moving to the States… must have been back in 1993, when I was working at Logos, in Italy, and that fits right at the beginning of Atril’s time line. So, judging from the serial number (27) still clearly visible on them, I must have been one of the very first users of CAT tools for Windows. I didn't use Déja Vu for long: in 1994 I moved to the States to work in the translation department of J.D. Edwards, a software company. Shortly after I arrived the company adopted a translation memory program, but that was IBM's TM2 (later still, J.D. Edwards changed to Trados). But I still remember the excellent technical support we received from Emilio Benito, the late founder of Atril.